A simple repository of movies I like - some more than others. A Place in the Sun was disturbing. How's that for blunt? I mean, it was a great movie but man - it's squirm worthy, rife with so many tragic themes. 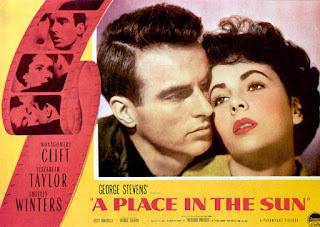 It stars Montgomery Clift, Shelley Winters and Elizabeth Taylor, and they do the film justice, although Clift has that whole brooding thing going on throughout, but I suppose that's the point! Of all the things going on in this movie, the part that strikes me most is the desperation of Shelley Winter's character. She's desperate for someone to love her, someone to pay attention to her, and when her husband loses interest, her desperation is palpable. Disturbing. 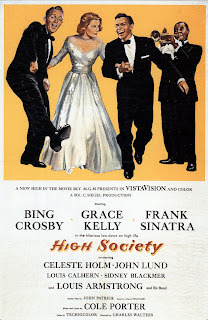 High Society, for me, rates as a comfort movie - you know, like comfort food it gives a sense of gemutlichkeit, that nearly indefinable feeling of warmth, friendliness, and good cheer - comfort! I remember seeing this movie as a kid, and I certainly didn't understand the premise, or innuendo, but it had Bing Crosby in it! Of course, today I'm more like - it has Grace Kelly in it! That being said - along with Bing Crosby and Grace Kelly, Frank Sinatra and Celeste Holm also starred, and there was even a couple short clips with the inimitable Louis Armstrong! REVIEWS: Three Movie Buffs always have such interesting reviews, and this one doesn't disappoint! As a matter of fact, I didn't realize this was a remake of Philadelphia Story, which I'll eventually add to this blog. Even Variety liked the movie! George Kittredge: This is all your fault! You and your whole rotten class! 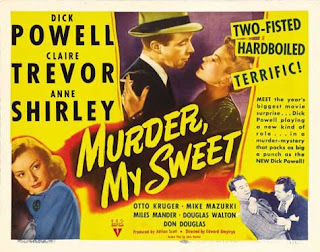 REVIEWS: The December 31, 1944 edition of Variety had a taut review of Murder, My Sweet, which is apropos for a tight film noir. But - the Film Noir of the Week blog did a masterful review here! Philip Marlowe: My feet hurt. And my mind felt like a plumber’s handkerchief. RATED: Great movie! WATCH IT AGAIN: Definitely DO I WANT TO OWN IT? : I don't think I need to own it, no. 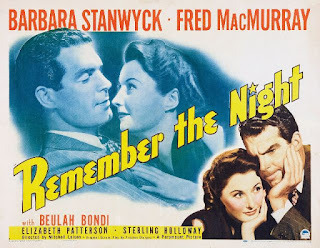 Remember the Night is another of those classic movies set at Christmastime that I absolutely love. It stars Fred MacMurray and one of my favorites - Barbara Stanwyck! Much like Christmas in Connecticut, this film has the humor, homey-ness and nostalgia that I enjoy so much at Christmas. Here's a synopsis from John Oswalt on Amazon: Just before Christmas, Lee Leander is caught shoplifting. It is her third offense. She is prosecuted by John Sargent. He postpones the trial because it is hard to get a conviction at Christmas time. But he feels sorry for her and arranges for her bail, and ends up taking her home to his mother for Christmas. Surrounded by a loving family (in stark contrast to Lee's own family background) they fall in love. This creates a new problem: how do they handle the upcoming trial? So, we come to one of my favorite movies across all genre and eras - The Man Who Came to Dinner. I don't remember the first time I saw it, but I know that for years I didn't know the name of the movie, and, in the days before the internet, I just couldn't find it. That all changed when I got internet service - I have no idea when that was, but this was one of the first things I searched for. 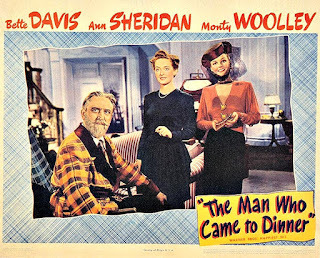 I have loved every movie Monty Woolley has been in, so this movie is a shoe-in, The Man Who Came to Dinner also stars Bette Davis and Ann Sheridan - again, two of my favorites! 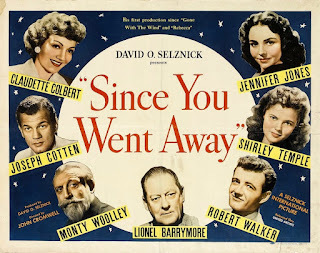 Since You Went Away is a star-studded movie set on the home-front of World War II. This is another of those movies that's like comfort food to me, along with the likes of The Man Who Came to Dinner, The More the Merrier, and a host of Christmas classics. Among the great stars in this movie are Joseph Cotten who is one of my favorites (Niagara and Shadow of a Doubt), and Monty Woolley (The Bishop's Wifeand The Man Who Came to Dinner) who always makes me smirk, thinking I'll probably end up like him - crotchety and kind! REVIEWS: Here's an excellent classic review by Bosley Crowther from the July 21, 1944 edition of the New York Times. I love classic reviews for classic movies! Here's another, more contemporary review from Filmsite. FAVORITE QUOTE:Colonel William G. Smollett: Good morning. Mrs. Hilton, I presume? 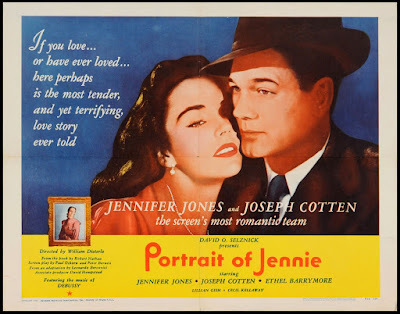 Portrait of Jennie was a surprisingly good movie! As much as I love old movies. .. and as long as I've been watching them, I only recently learned of this one. And I'm glad I did. Joseph Cotten is one of my favorite actors (Shadow of a Doubt being one of my top five movies), and who doesn't like Jennifer Jones? REVIEWS: Bosley Crowther absolutely pans this movie in his March 30, 1949 New York Times review. Here's a snippet: "...the long-bow that's drawn in the sound-track and the splurge of the final spectacle are the elements in the picture that render it maudlin and banal. A ponderous and meaningless narration, concerned with the "levels of time," is the same sort of trap for the emotions as a soggy and saccharine musical score..."